Friday, Sept 21st at 4pm the Pelham Art Center is hosting the Shiimy Mob! Free and all are welcome. Come see this belly dancing flash mob for yourself. The primary objective of Shimmy Mob is to raise donations and awareness for those affected by domestic abuse. Funds raised via Shimmy Mob are donated to shelters for abused women and children, worldwide. 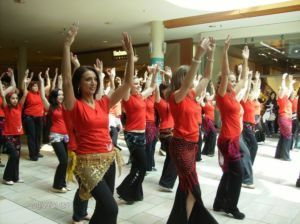 The secondary objective is to produce a flash mob type event formed by dancers and non-dancers, performing a choreographed medley of belly dance styles. This event brings attention to an important global issue and celebrates the art of belly dance. This flash mob will be a fun an exciting performance at the Pelham Art Center.